Kids will love this cute four wheel bike with durable tires, which is helpful to take them to every where they want to go. 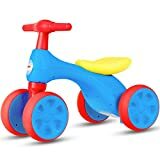 This baby balance bike features the secret little storage box under the comfort-ride seat for carrying little toys and snacks during the ride! And the stable wheel base and easy-grip handlebars help kids get rolling, even the littlest riders! Our baby balance bike is designed for exercising on flat paved surfaces and gently sloping terrain. The toddler bike is the first bike for toddler to develop balance and learn to walk. It’s the best gift for toddlers! It brings fun and joy to kids and brings the wonderful childhood to them! [Comfortable and Safety Design]:Our baby balance bike has fully enclosed wheels, which can avoid clamping your kids’ feet. Designed with cute smooth handle bars, which are non-slip, comfortable, and secure for kids to touch. With steering limited, our mini bike toddler is not rotating 360 degrees in order to avoid baby’s side falling over or rollover. With cute handles and soft HDPE seat make the mini toddler bike more comfortable when kids ride on the baby balance bike for long time. 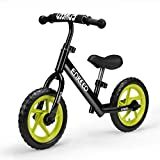 [Fun Storage and BB Sound]:The baby balance bike is equipped with “BB” sound in the seat and a built-in little storage box, therefore your children can bring small toys or snacks during the ride. When children sit on the seat, the baby balance bike with “BB” sound invites children to join on their own adventure. When the “danger” arises, kids can use the sound to alert, and it will create a fun world. 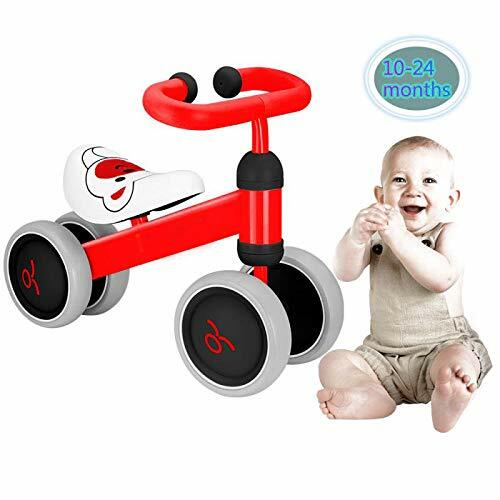 [Stable 4 Wheel Design]:This baby balance bike features firm 4 wheel designed, which makes the baby balance bike stable. Therefore this mini balance bike is much easier for children to learn walking and improve kids’ coordination. 2 big front wheels are helpful to keep the bike upright while the toddlers get used to keep balance by their feet. [Amazingly Easy to Use]:Our four wheel bike’s lightweight but high-quality HDPE and TRE material makes it easy to carry around thanks to the handle bar. And our four wheel bike requires the easiest assembling. This four wheel bike only needs to assemble the handlebar, wheels and seat in few minutes by tools. 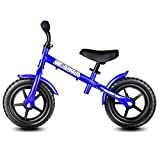 The small size and lightweight makes this baby balance bike perfect to storage. 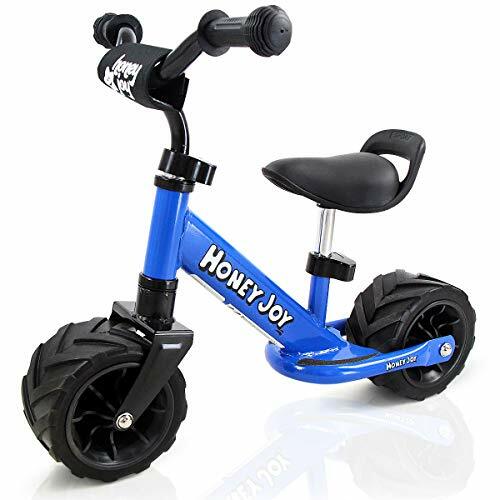 [Perfect Gift for Toddler]: The four wheel bike is designed to help children to learn and develop good balance and steering skills in a fun way. Their vibrant colors displays their own personality. It promotes physical activity and it’s also helpful to kids to improve independence and an increasingly confident sense of “I can do it!”. 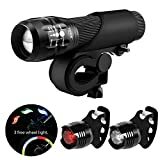 And it’s great for both indoor and outdoor use.